Welcome to our ultimate guide for collecting every Power Moon from the Seaside Kingdom in Super Mario Odyssey! 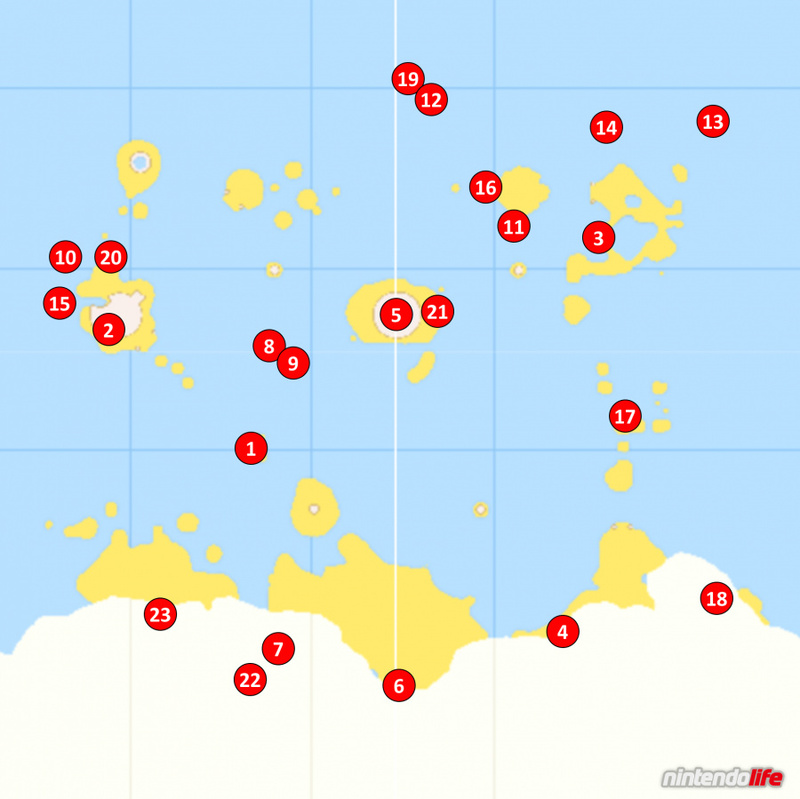 Below, you'll find maps detailing the exact location for all 71 of the Power Moons located in this Kingdom, as well as descriptions on how to get each and every one of them. 1. The Stone Pillar Seal: The first four Power Moons are obtained by unblocking seals dotted around the Kingdom. The first is directly north of the Odyssey in the direction of Bowser's footprints - simply head over to it, capture a Gushen to boost yourself to the top, and grab the Power Moon. 2. The Lighthouse Seal: The second seal is at the top of the lighthouse in the west. To get there, though, you'll have to go past the lighthouse on the right hand side and make your way down the well. Dive down and capture a Cheep Cheep to make your way through and, when you reach the other side, enter the green pipe to reach the top of the lighthouse and grab your Power Moon. 3. The Hot Spring Seal: The third seal is in the hot spring on the east side of the Kingdom. Capture a Gushen before heading up to the top so that you can wash away all of the lava. Once you've cleared the lava, you should be able to see this Power Moon glistening below the water. 4. The Seal Above the Canyon: For the fourth seal, head to location number 4 on our map in the southeast to find a tunnel with spiky shells rolling down it. To get this Power Moon, you simply need to run past these shells and make it all the way to the top. When you get there, smash your way through the crates to find the Moon. 5. The Glass Is Half Full! : After unblocking all four seals, you'll need to take on the giant, uppity-looking octopus sitting in the middle of the Kingdom. You'll need to chase the octopus all over the Kingdom as a Gushen, using your abilities to fly above it, spray water at its head, and eventually ground pound it several times to defeat it. Do this and you'll receive a Power Moon. 6. On the Cliff Overlooking the Beach: From the Odyssey, look to the south and you should be able to see a Power Moon on a high cliff. Capture a Gushen from the sea nearby and use it to boost up to the Power Moon by climbing up ledges in the cliff face - there is a small pool along the way where you can re-water your Gushen if you run out. 8. Ocean-Bottom Maze: Treasure: Head to location number 8 on our map and dive down underwater. You'll find a series of green pipes that all take you into an underwater 2D section. Start by going into the southwestern one and jump onto the wall on the left. Jump again to reveal some hidden blocks that will create a path to the Power Moon. Now exit and swim up to the northeastern pipe - entering here will allow you to run down to the left, then over to the right, to collect your Power Moon. 9. Ocean-Bottom Maze: Hidden Room: In the same location as the previous Power Moon, head into the southeastern green pipe and jump up to the Koopa above. Jump on the Koopa once, and then kick his shell off the edge to the left. This will smash a block at the bottom of the area that can be entered by ducking down with Mario after running at the gap. You'll find a Power Moon waiting inside this hidden area. 10. Underwater Highway Tunnel: At around location 10 on our map you should find an underwater tunnel with three Cheep Cheeps swimming back and forth across its entrance. Head inside this tunnel and use your ground pound - or a Cheep Cheep's spin attack - on the square patch of bricks in the floor to reveal another tunnel. You'll find a Power Moon inside. 11. Shh! It’s a Shortcut! : Just to the south of the Ocean Trench East checkpoint flag you should find an underwater tunnel (there's a coin floating in a bubble at its entrance). Capture a Cheep Cheep and make your way through the tunnel - you should find a Power Moon about halfway through. 12. Gap in the Ocean Trench: Almost as north as you can get - at location 12 on our map - you should find a Sphynx hidden away down in the depths of the sea. Just above the Sphynx, on the wall behind its head, you should spot a small tunnel. Swim inside, turn right, and then go down, to collect a Power Moon. 13. Slip Through the Nesting Spot: Dive underwater at location 13 on our map and look around very carefully for a small tunnel just behind a spout that is shooting out bubbles. Inside you'll find a deadly Maw-Ray - swim towards its lair and turn to the right to find a Power Moon. 14. Merci, Dorrie! : Head towards the purple Dorrie (the purple half of the Crazy Cap store is on its back so you can find it easily on your map). A Power Moon is floating underneath this Dorrie under the water. 15. Bonjour, Dorrie! : There is a Power Moon floating high above the yellow Dorrie (you can find Dorrie on your map because the gold coin half of the Crazy Cap store is on its back). You can either use a Gushen to reach the Moon from Dorrie's back, or fly down to the Moon using Glydon who is sitting at the top of the Lighthouse. 16. Under a Dangerous Ceiling: For this Power Moon, you'll have to head directly underneath the western side of the small island indicated by the number 16 on our map above. On the underside of this island you'll find a group of Komboos (the seaweed things) hanging from the island above. Deal with these and then ground pound the glowing patch on the ground below them for a Power Moon. 17. What the Waves Left Behind: Head to the collection of tiny rock islands on the eastern side of the Kingdom. At the one indicated by the number 17 on our map above, you should find a Komboo sitting inside a tiny pool of water. Take out the Komboo using Cappy, and then ground pound in the water there for a Power Moon. 18. The Back Canyon: Excavate! : Make you way to the very southeastern point of the map - you're heading for location number 18 above but to access it you'll need to go further around to the bottom corner of the map. You'll find a little hidden section of land with Moonsnakes and steps leading upwards. Climb the steps until you reach a glowing patch of ground right next to a Moonsnake - ground pound this spot for a Power Moon. 19. Bubblaine Northern Reaches: Head right to the very north of the map, aiming for location 19 above. You'll find four bumps in the sand underwater, one of which will be glowing. Ground pound or spin attack this bump to summon a bunch of Komboos - one of the other bumps will now be glowing. Keep hitting the glowing bumps as they appear, making sure to keep yourself safe from the Komboos who will quickly gang up on you, and eventually you will be rewarded with a Power Moon from the middle bump. 20. Wriggling on the Sandy Bottom: Tucked away underwater underneath the northern side of the Lighthouse island is a red hat door. Dive down to find it, head inside, and use Cappy to stun the glowing mound of sand that is moving around inside. A Power Moon will pop out when you manage to ground pound it. 21. Glass Palace Treasure Chest: Capture a Cheep Cheep and head to the eastern side of the large central island. Under the island you'll find a tunnel full of Komboos - make your way through and keep looking over to the left as eventually you'll see a second tunnel heading off in that direction. Swim through this tunnel and hit the treasure chest you find there to reveal a Power Moon. 22. Treasure Trap Hidden in the Inlet: Starting from the Odyssey, run over to the west keeping an eye on the bottom of the cliff to your left. You eventually spot a short but wide cave underwater - dive down here and walk through into this cave. You'll need to hit the treasure chests here in order - back, left, right, then front, to get the Power Moon. 23. Sea Gardening: Inlet Seed: Power Moons 23-26 require you to find seeds that are scattered around the Kingdom, and then take them to the roof of the building at location 23 on our map. The Inlet Seed is located underwater in the narrow strip between the island where the seeds need to be planted, and the one where the Odyssey is sitting to the east of it. Collect the seed, throw it into one of the flower pots, and wait for it to fully grow to claim the Power Moon. 24. Sea Gardening: Canyon Seed (see location 23): Power Moons 23-26 require you to find seeds that are scattered around the Kingdom, and then take them to the roof of the building at location 23 on our map. The Canyon Seed is just a little further along the path that you need to take for Power Moon 18 so follow the steps for that Moon above and keep walking a little further to find it. When you've collected it, throw it into one of the flower pots and wait for it to fully grow to claim the Power Moon. 25. Sea Gardening: Hot-Spring Seed (see location 23): Power Moons 23-26 require you to find seeds that are scattered around the Kingdom, and then take them to the roof of the building at location 23 on our map. The Hot-Spring Seed is sitting on a small bit of land sticking out from the northeast side of the Hot Spring Island (the furthest main northeastern island). Collect the seed, throw it into one of the flower pots, and wait for it to fully grow to claim the Power Moon. 26. Sea Gardening: Ocean Trench Seed (see location 23): Power Moons 23-26 require you to find seeds that are scattered around the Kingdom, and then take them to the roof of the building at location 23 on our map. The Ocean Trench Seed is located on a small platform that is sitting right next to the giant Sphynx underwater - the Sphynx is deep down underwater near location 12 on our map above. Collect the seed, throw it into one of the flower pots, and wait for it to fully grow to claim the Power Moon. 27. Seaside Kingdom Timer Challenge 1: Head into the water at location 27 on our map, looking out below for a thin crack in the floor - you should see a giant red button through the gap. When you've found it, swim down and hit the button to reveal extra platforms in the 2D section on the wall beside you. Quickly head inside and make your way to the Power Moon - this could take a couple of attempts. 28. Seaside Kingdom Timer Challenge 2: Dive underwater at location 28 on our map to find a scarecrow. Throw Cappy at the scarecrow to begin a timer challenge - you only need to swim in a straight direction to get the Power Moon but you have very little time to do so. The best tactic is to use 'ZL' and 'Y' to perform quick dashes through the water. 29. Found on the Beach! Good Dog! : On the beach surrounding the Odyssey you should be able to find a dog. Spend some time with the dog and play catch with it by throwing Cappy at for it to catch. After a while of playing, the dog will start digging up patches of glowing sand with goodies inside. Eventually, one of these patches will contain a Power Moon - just be patient and keep playing, running around to new areas of the beach, until it finds it (in our game it found it at location 29 on our map). 30. Moon Shards in the Sea: Under the water at location 30 on our map, you'll find a scarecrow. Throw Cappy at the scarecrow and dive down through the gate that opens. Inside you'll need to find five Moon Shards - all whilst dodging the attacks of the Maw-Ray. Make sure to keep on top of your oxygen by using the bubbles as you explore and don't worry if you lose all of your health from Maw-Ray attacks - the shards you collect will stay in your collection and you can re-enter. When you have all five you'll be rewarded with a Power Moon. 31. Taking Notes: Ocean Surface Dash: On the beach at location 31 on our map above you'll find a glowing treble clef and a Rocket Flower on a small sand ramp. Line yourself up so that you can collect the Rocket Flower and sprint through the treble clef - the music notes you need to collect will all appear in a straight line going into the water from this direction. When you have collected all of the notes, you'll be rewarded with a Power Moon. 32. Love by the Seaside: Warp to the Rolling Canyon checkpoint flag and capture a nearby Goomba. You'll need to stack up several Goombas for this Power Moon so hop onto its nearby buddies - you should be able to spot around five of them. Now waddle your way through the canyon with the spiky shells that are rolling down - you'll eventually find a Goombette on the left hand side of the canyon. Walk near her to be rewarded with a Power Moon. 33. Lighthouse Leaper: For this Power Moon, capture the Glydon who is sitting at the very top of the Lighthouse, and glide down to the east, landing right in front of the snail sitting on the beach in front of the Glass Palace. 34. Good Job, Captain Toad! : Capture a Gushen and look out for the platforms sticking out of the cliff behind the Odyssey. Boost up to these to find that one of them has a small body of water in it - land here to replenish your water supply, and then boost up, and then to the left, to find another small platform with a Power Moon sitting in open space. Using the same technique again, launch yourself skywards from this platform and continue your journey to the left. You'll need to fly around a slight corner in the cliff face before eventually getting your first view of Captain Toad's little platform. Land there and talk to him for this Power Moon. 35. Ocean Quiz: Good! : If you've already spoken to the Spyhnx - and therefore added Power Moon number 40 to your collection - talk to the Sphynx again to start a second quiz. If you're looking for the answers, they are: Four, Attack, Resort Outfit, To Ask Questions. Get all of these right and the Sphynx will give you a Power Moon. 36. Shopping in Bubblaine: You can purchase this Power Moon from the snail sitting on the back of the yellow Dorrie. It'll cost you 100 gold coins. 37. Beach Volleyball: Champ: Head to the beach at location 37 on our map in the southwest to find a volleyball court. Walking onto the court will begin a game and you only need to hit the ball 15 times for this Power Moon. To do so, keep your eye on the shadow of the ball on the floor, making sure you get there in time to make contact with it. If you're a little too far away from the ball - throw Cappy at it to try and hit it that way. 38. Beach Volleyball: Hero of the Beach! (see location 37): Giving the Jump-Rope challenge from the Metro Kingdom a pretty serious run for its money as one of the hardest Power Moons in the game, this task requires you to hit the ball back 100 times. Head to the volleyball court (directions are explained in Power Moon 37 above) and play another game. The best advice for this Power Moon is to try and keep Mario in the middle of the court at all times, using Cappy to hit the ball back. If you stay in the middle, Cappy will always be able to reach the ball wherever it lands after one quick step from Mario. 39. Looking Back in the Dark Waterway: Head up to location 39 on our map to re-enter the waterway that originally took you to the lighthouse. Inside, immediately after the set of three Cheep Cheeps near the entrance, look over to the left to find a Power Moon sneakily hidden in a small alcove. 40. The Sphynx’s Underwater Vault: For this Power Moon you'll need to talk to the giant Sphynx underwater at location 40 on our map. Answer his question - the answer is Bubblaine - and then enter the chamber that appears to find a treasure chest containing a Power Moon. 41. A Rumble on the Seaside Floor: Just behind the Odyssey to the west, you'll find a green pipe sticking out of the wall. Inside, you'll need to use the HD Rumble in your controller(s) to find the Power Moon hidden underground - ground pound where the vibration is strongest to get it. 42. A Relaxing Dance: For this Power Moon you'll need to be wearing Resort Hat and Resort Outfit (available from this Kingdom's purple Crazy Cap store). When you're wearing them, head to the beach house in the southwest (where the seeds need to be planted on the roof) and talk to the Bubblainian to gain access to the locked door just behind it. Inside, walk onto the stage to perform a little dance and claim your Power Moon. 43. Wading in the Cloud Sea: Right beside the beach house in the southwest, use a parasol to jump up to a small archway with a rocket on top. Capture the rocket to arrive in a new, cloudy area. Use Cappy to show paths through the clouds, making your way to the end to find this Power Moon. 44. Sunken Treasure in the Cloud Sea (see location 43): In the same area as Power Moon 43, keep an eye out on the left hand side as you'll eventually come across a path that will take you over to a green, square-shaped section. Use Cappy to show you safe places to step, and make your way over to this green square - a treasure chest containing a Power Moon is sitting inside it. 45. Fly Through the Narrow Valley: Capture a Gushen and head to the southwest of the Beach House - you should spot a small path leading up to a cave in the cliff wall. Go into the cave and use your Gushen to boost upwards and find the red hat door. Inside, use the Gushens to travel through the area, replenishing your water supply when you can. When you are reaching the very end you'll need to drop down to find this Power Moon (which is a strong possibility anyway as its very easy to run out of water). Just before the very final platform, dropping down to the depths below will reveal a hidden area with a Power Moon. 46. Treasure Chest in the Narrow Valley (see location 45): In the same area as Power Moon 45, you simply need to make it to the final platform. To do so, you'll need to be extremely careful with your water supply as you near the end of the area - make sure to only use as much as you really need to. 47. 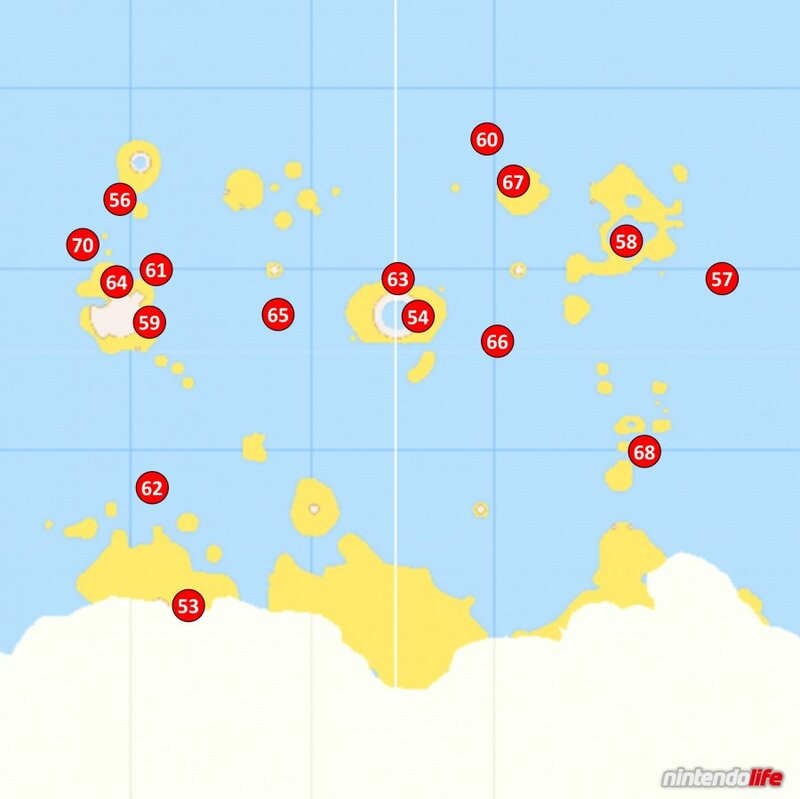 Hurry and Stretch: Warp to the Hot Spring Island checkpoint flag and jump off the southwestern corner of the island. Right down on the seafloor, you'll find a red hat door - head inside and capture the Uproot near the entrance. You'll need to move through this area with decent speed as the lava below you will start to rise - this Power Moon is at the very end of the trial. 48. Stretch on the Side Path (see location 47): In the same area as Power Moon 47, just before you make it to the very end of the area with the Uproot, you should notice an extra path on the right with a Power Moon floating above it. Make sure to head over to this path to grab this Power Moon. 49. Secret Path to Bubblaine! : To get this Power Moon, you'll need to enter Bubblaine through a warp painting from a different Kingdom. Depending on your choices throughout the game, the warp painting you need will either be located in Bowser's Kingdom, or the Mushroom Kingdom. In Bowser's Kingdom, head to the Main Courtyard Entrance checkpoint flag and run around to the back of a building on the left. If the painting here depicts the Seaside Kingdom's water arches, jump inside to be warped to this Power Moon. If a different Kingdom is shown instead, head to the Mushroom Kingdom and run south from the Odyssey to find a painting in the middle of a group of trees. This should take you to the Seaside Kingdom if the previous painting lead elsewhere. 50. Found with Seaside Kingdom Art: The hint art for this Power Moon can be found at location 50 on our map above, just above a ledge behind the Odyssey to the west. You'll notice that it seems to display the word 'KEEP' which isn't as immediately clear as other hints have been. This actually refers to a spot in the Metro Kingdom - right next to the scooter near the entrance of the Kingdom - where the words 'Keep Clear' are painted on the road. You'll need to ground pound the floor just above the two 'E's in this spot to get this Power Moon. 51. Seaside Kingdom Regular Cup: Head to location 51 on our map above (in the north) and talk to the Koopa to challenge him to a race. The easiest way to win this one is to swim up to the surface at the start, capture one of the Gushens on your way to the goal, and boost your way over to the area just to the right of the canyon with spiky shells inside. You'll notice a cliff with Luncheon Kingdom forks sticking out - use Cappy on these forks to climb up directly to the goal, cutting out a huge chunk of the course and easily beating the other Koopas. 52. Peach in the Seaside Kingdom: To find Princess Peach, jump into any of the four fountains that are shooting upwards through the sky to land on the area where the giant octopus was originally sitting in the centre of the Kingdom. Talk to her to receive a Power Moon. 53. Above the Parasol: Catch! : Warp to the Beach House and jump onto the parasol next to the wall to make contact with this Power Moon. 54. What Shines Inside the Glass: Jump into any of the four fountains that are shooting upwards into the sky to land onto the area where Princess Peach is standing. Dive down to the bottom of the water here to locate this Power Moon. 55. A Fine Detail on the Glass (see location 54): There is a Power Moon on the outside of the central structure where Princess Peach is standing (on the eastern side). Either jump into any of the four fountains shooting up to the sky to land next to Princess Peach, looking for the Moon below and jumping down, or use a nearby Gushen to boost yourself up onto the structure, and from there boost up again to reach the Power Moon. 56. Underwater Highway West: Explore! : Make your way over to the small island with the waterway that originally lead you to the Lighthouse. If you look down into the water below (towards location 56 on our map above) you'll see a Power Moon on a small ledge underwater. 57. Underwater Highway East: Explore! : Head to location 57 on our map above (to the east of Hot Spring Island) and head underwater. It can be slightly tricky to see depending on the angle you approach it from, but a Power Moon can be found amongst some underwater plants on a small ledge. 58. Rapid Ascent on Hot Spring Island: Capture a Gushen and boost it up to the pool in the middle of the Hot Spring Island. Boost up again - shaking your controller(s) for maximum 'boostage' - to make contact with a Power Moon that is floating above the water. 59. A Light Next to the Lighthouse: Warp to the Lighthouse and hold down the 'Y' button to throw Cappy at the glowing pole on its eastern side. After a few seconds of spinning on the pole, a Power Moon should pop out. 60. The Tall Rock Shelf in the Deep Ocean: At location 60 on our map, dive down deep underwater. You'll find several clusters of sparkly, blue platforms here and one of these clusters has a small point protruding from it that will be glowing. When you find the glowing point, hold down 'Y' to throw Cappy at it for a few seconds to receive a Power Moon. 61. At the Base of the Lighthouse: Literally "at the base of the Lighthouse" (at point 61 on our map) there is a small glowing patch of sand in the middle of some sparkly blue platforms. Ground pound this spot for a Power Moon. 62. Bird Traveling Over the Ocean: There is a glowing bird travelling around the Seaside Kingdom and, if you can make contact with it, you'll receive a Power Moon. It flies across almost the entire Kingdom and the easiest ways to catch it are to either use Glydon (who is sitting at the top of the Lighthouse) to glide towards it, or by using a Gushen to bash it from below when it flies low enough. We managed to get it at location 62 on our map by using a Gushen, but any tactic is fine. Just make sure not to warp anywhere after touching the bird as the Power Moon will reset - you need to touch the bird, and then the Moon, without warping. 63. Caught Hopping at Glass Palace! : You'll find a rabbit near the Glass Palace checkpoint (likely around location 63 on our map). Use Cappy to stun the rabbit as it runs away and then bump into it to receive a Power Moon. 64. Seaside Kingdom Timer Challenge 3: Warp up to the Lighthouse and throw Cappy at the scarecrow. Make sure to perform a long jump off the platform that appears towards the Power Moon right down below. Keep holding the stick in the direction of the Moon as you fly to reach it in time. 65. Taking Notes: Ocean-Bottom Maze: Head underwater at location 65 on our map to find several green warp pipes. Enter the northeastern pipe to find a glowing treble clef inside the 2D section underwater. Collect all of the music notes that appear to receive a Power Moon. 66. Taking Notes in the Sea: Head underwater at location 66 on our map and you should spot a glowing treble clef sitting on top of an underwater pillar. Capture one of the nearby Cheep Cheep before touching it, and then use its superior swimming ability to collect all of the music notes that appear once you do. Get them all in time and you'll be rewarded with the Power Moon. 67. Seaside Kingdom Master Cup: Head to location 67 on our map (in the north) and talk to the Koopa to challenge him to a second race. The easiest way to win this one is to swim up to the surface at the start, capture one of the Gushens on your way to the goal, and boost your way over to the area just to the right of the canyon with spiky shells inside. You'll notice a cliff with Luncheon Kingdom forks sticking out - use Cappy on these forks to climb up directly to the goal, cutting out a huge chunk of the course and easily beating the other Koopas. 68. Aim! Poke! 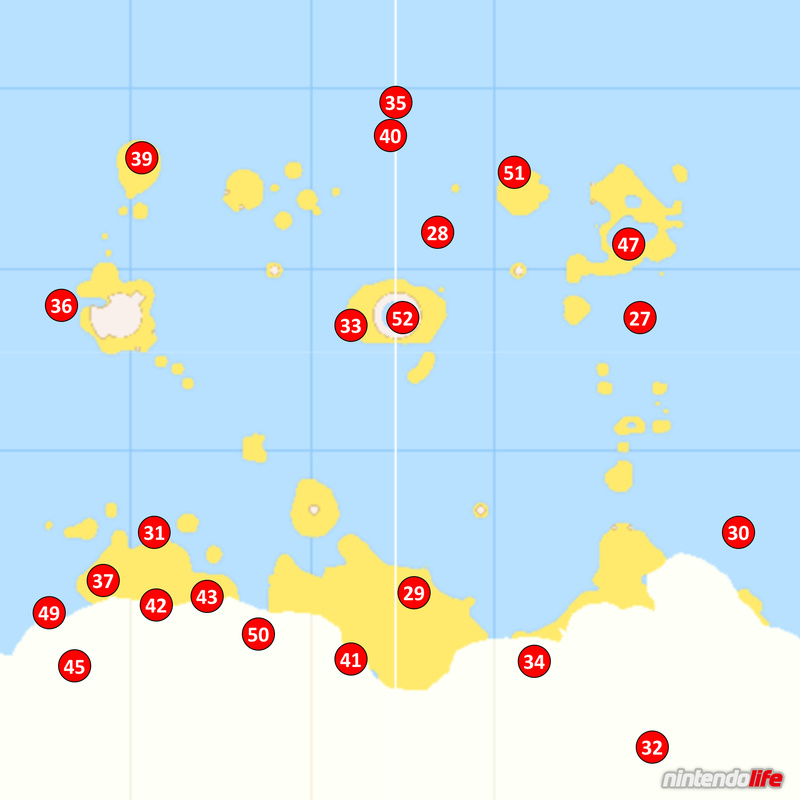 : You'll find a grey warp pipe underwater at location 68 on our map above (within the small islands just north of the Rolling Canyon). Enter this pipe, capture the Pokio (bird) inside, and use its poking ability to send the rolling bombs towards the bricks at the other end of the room. You'll eventually dislodge a ramp - just keep sending bombs up this ramp until you break the remaining bricks and you'll be able to access the Power Moon hovering behind the bars. 69. Poke! Roll! (see location 68): In the same area as Power Moon 68, capture the Pokio and turn around to face the grey pipe. You'll notice a curve that goes around the back wall, leading to a block. Stand on the left hand side (near the start of this curve) and poke a bomb so that it flies around the curve and smashes the block on the other side. A Power Moon is waiting inside when you manage it. 70. The Spinning Maze: Search! : Just to the northwest of the Lighthouse, under the water, you should be able to spot a grey warp pipe. Head inside and make your way around the maze, collecting all five Moon Shards as you go. When you've collected all five, you'll be rewarded with a Power Moon. 71. The Spinning Maze: Open! (see location 70): In the same area as Power Moon 70, make your way to what would be the top-right corner of the maze when looking at it from where you begin. After spinning the yellow walls in that corner, you'll be able to fall right through the floor to a hidden area with a treasure chest containing a Power Moon. We hope that you have found this guide on collecting all Power Moons in Super Mario Odyssey's Seaside Kingdom useful. Let us know if you've managed to grab them all with a comment below. Thanks! #69 was driving me crazy! Mario can't breathe in water for long time even has possessed Cheep Cheep, right ? @Anti-Matter he can breathe forever with cheep cheep i thought? This kingdom was awesome. Reminded me quite a bit of Sunshine. Give us Sunshine 2, Nintendo! @Anti-Matter @Matthew010 Yeah, as a Cheep Cheep there is no restriction on breathing. Perfect for exploring underwater! @roro26 It’s my favorite kingdom too. I’ve always loved the beach. @RyanCraddock I look forward to getting there soon - I'm in Wooded, how many more? Jump up in the sky, jump up superhigh, cause you my superstar can't you see. 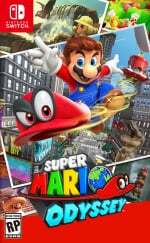 Jump me grab coins with me and yes boss i'm buying a switch to get ready for this because of Odyssey. What you guys think i already got a switch, but i think i made a nice take on the song.